GHOSTS: AN HISTORICAL JOURNEY PART 1 BY KEN DE COSTA The question that persists among all paranormal investigators and supernatural enthusiasts is why do ghosts even exist? If there is comfort, peace and enlightenment that awaits in the afterlife, then why do they continue to wander the earth seeking some form of reconciliation they may never achieve here? Or, are they - as is often assumed - “lost souls” unaware or unaccepting of their mortal fate, destined or determined to interact with or at the very least linger amongst, the living. Often they are seemingly confined to a particular place or in some cases, a particular living person. Their ultimate purpose remains an enigma. At times they are quite benevolent, bringing us comfort in times of grief and uncertainty or warning us of impending dangers and helping us to navigate the minefields of our sometimes volatile lives. Some choose to remain in a place where their happiest moments in life took place. Often, these spirits may appear in the form of a loved one who has passed or is about to meet that fate concurrent to their sighting. We have assigned terms like “spirit guides” or “guardian angels” to these more magnanimous entities. There is a darker side to the existence of ghosts, as some display a resentment of the living either as a whole or towards a specific individual. These spirits tend to be more territorial, protecting their homes and possessions with a fervor which often results in living beings in current ownership of these things being terrorized and subjected to torment and in rare instances, physical harm. Others may be the victims of wrongful or violent deaths and thus wander the earth seeking vengeance and retribution against those who ended their lives, or seeking justice for the wrongful acts perpetrated against them. What prompts our combination of fear and fascination of such encounters? Perhaps the simplest reason is that ghosts represent us. They are us. And they are a reminder of our ultimate destiny and the inescapable conclusion that all of us will at some point leave this life and must face the unknown that lies beyond it. At times we think of ourselves as generationally superior intellectually to anyone or anything that has preceded us and the belief in ghosts is a more contemporary phenomenon. But the idea of ghosts spans almost all of the human experience. Documentation is not easily found in ancient records, but we do share a common link with the past in the form of legends, passed down and re-told through the ages in oral and written forms. THE HERETIC PHARAOH One of the earliest of these legends can be found in Eqyptian folklore and it concerns the life of Amenhotep IV, a young pharaoh who inherited a kingdom from his father. He was also known as The Heretic Pharaoh or The Rebel Pharaoh. He would change his name to King Akhenaten (”living spirit of the Aten”), to better reflect his belief in a single deity. He was the first pharaoh to do so and thereby created a monotheistic religion in which only one god was worshiped. He wrote about visitations from beings that came from the sky and was worshiped as a god by his people who believed he was a direct descendant of Aten, the disc of the sun. It is generally believed that his wife was his half-sister, Nefertiti. It was tradition among Egyptian pharaohs that the ruler would marry the oldest daughter of his father. It is further believed that she was only 12 when she married Akhenaten and while he had other wives, Nefertiti was foremost among them and was eventually elevated to divine status. Nefertiti bore him six daughters and another of his sisters bore him two sons, one of which, Tutankhamun went on to be crowned kind at the age of 8 or 9. Before Akhenaten, Egypt was a polytheist culture where literally hundreds of gods were worshiped, chief among them being Aman-ra, the sun god. Within a short time, Akhenaten had all other religious icons removed and ordered the building of a new capital city which was called Armana. 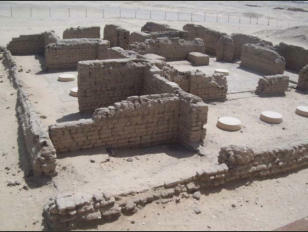 In all, a mass exodus of 20,000 people covered the 200 miles to Armana from the old capital, Thebes. 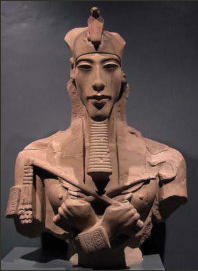 Many of the older followers still held Akhenaten in contempt for his newfound beliefs. The notion of essentially worshiping light was too radical and ethereal to those who preferred their gods a bit more “tangible.” It was during a celebration there to honor Aten that Akhenaten would finally incur the gods wrath. First, during all the festivities, his wife Nefertiti died. Then the death of an older sister and one of his six daughters would soon follow. Out of revenge, he had his soldiers strike the name and likeness of Aman- ra from every wall that bore it. After his death, all citizens of Armana would begin a sojourn back to the former capital of Thebes, leaving Armana a desolate and empty place. But, the god Aman-ra would have the final say, as legend has it that he placed a curse on the king for his heresy that forced him to wander his empty city for all eternity rather than ascend to his assumed place in the heavens. THE GHOST STORY In terms of the ghost story, one of the very first was written back in the 1st century A.D. by Pliny the Younger who wrote about a haunted village in Athens. Pliny was born Gaius Caecilius and was a lawyer, author and magistrate in Ancient Rome. It was said both he and his uncle, Pliny the Elder witnessed the eruption of Mount Vesvius in 79 A.D. with the volcanic blast taking the life of he elder as he endeavored to rescue people from the all-consuming cauldron. Pliny the Younger was said to be very fond of villas, so it is no surprise that this is the setting of one of the initiatory ghost stories in history. In the story, visitors and lodgers in the villa were constantly frightened away by the apparition of an elderly man, looking quite gaunt and straggled with a long beard and hair, rattling chains that were affixed to his hands and feet. This visage would be the forerunner of many similar reports through generations. The inhabitants of the one house in particular that the ghost frequented could not sleep at night due to the fear and anxiety that overcame them as they waited for the ghostly old man to appear yet again. Even during the day, when the phantom was not to be seen, they were haunted by replaying the previous night’s events in their minds in a constant loop. They eventually descended into a form of madness as their horror never ended and sleep eluded them. Eventually, they moved out of the home and left it to the ghost rather than suffer through one more night of mayhem and panic. It was hoped that somehow they could find someone who was unaware of the house’s malice and posted it for sale. It was at this time a philosopher named Atenodorus arrived in Athens and saw the posting but was suspicious of why the cost was so low. Finally, someone told him the whole story and to their surprise he was not dissuaded in the least and eagerly purchased the home. As darkness drew near in his first night in the house, he requested a couch be made up for him at the front of the house. He asked for writing materials and a lamp to illuminate the small area and with that he was determined to not allow the stories to become a distraction or influence him unduly in any way by immersing himself into his writing. For a long period of time the house remained quiet in the stillness of the night. Then, he began to hear the rattling of chains in the distance, growing louder. Athenodorus, determined not to succumb to the stories he had been told, refused to stop writing or even lift his head from the paper lest the sounds influence him in any way. But the noises he heard would not stop and grew ever louder until they appeared to be at the door and then inside the room itself. Athenodorus finally looked up and standing there beckoning to him to approach with one, bony finger, was the ghost looking exactly as it has been described to him. Athenodorus, rather than panic, simply lifted his palm toward the ghost as if to say “Wait just a moment.” He bent over and continued writing. The ghost, perhaps becoming rather impatient and more hostile, rattled his chains even louder at one point shaking them directly over the philosopher’s head. Athenodorus then picked up his lamp, and while the ghost began to move slowly, he followed with lamp in hand. The ghost reached the courtyard where it appeared to vanish into thin air. Standing there alone, Athenodorus picked up a handful of leaves and grass and marked the exact spot where the ghost vanished. The following day he asked the villa’s magistrate to have the spot he marked dug up. Upon doing so, the skeleton of a man wrapped in chains was discovered. The body had obviously been buried there a long time ago. The bones were gathered at given a proper burial. The ghost was seen no more from that time on. It is nothing short of amazing that so many elements of a haunting we simply take for granted now, the repeating apparition, the discovery of a body, its removal and burial in consecrated grounds and then the elimination of the phenomena as the body was finally at peace were written about back in 1 A.D. It does beg the question: Does this story and all the elements involved validate the type of sightings experienced in modern times - or - are these stories handed down exerting influence on our own? In any event, Athenodorus proved himself to be a very competent paranormal investigator without “certification” as a ghost hunter a degree in parapsychology or undue influence from popular culture. TALES FULL OF SOUND AND FURY The idea of “the ghost in literature” was just beginning to take shape and eventually would take a firm grasp on the imaginations of writers and poets yet to come. The best early example of this is in the works of William Shakespeare. Shakespeare did an amazing job of combining imagination and the supernatural to exemplify the characters in his plays. Macbeth and Hamlet are the two that most resonate as ghosts as a plot device, particularly in his most appealing genre, the tragedy. Using the idea of three witches predicting MacBeth’s ascension to the throne in Scotland is a precursor of the witch as both prognosticator and spell caster. The murders of Duncan and Banquo are both harbingers of the concepts of overwhelming guilt preying on the subconscious and the idea of ghosts returning from the dead with an eye on revenge. Shakespeare brilliantly leaves it open-ended in determining whether Banquo is in fact a real ghost or merely a figment of MacBeth’s penitent imagination. In Hamlet, the Danish prince’s father is murdered by his mother. His ghost appears to two guards and then finally to Hamlet himself suggesting he is not merely a figment of the imagination. Once again the idea of the dead returning to seek vengeance is at the heart of the play as dad comes back to take revenge against Claudius. In both plays ghosts are used to straddle the line between human psychology and the supernatural. CASUALTIES OF WAR The Revolutionary War was a spurring ground for the first ghost stories here in the United States. At the close of the Revolution, the British still had many ships anchored in Boston Harbor. With nowhere to escape to and essentially sitting ducks, the colonists opened fire on them. On one ship were a pair of newlyweds, William and Mary Burton. They were hoping to flee the bedlam and strife in the colonies and return to a more sedate and normal life in England. Desperately, their ship’s captain attempted to sail out the harbor, but a cannon ball from the Long Island Battery struck Mary in the back of the head. Miraculously, she did not immediately die from her catastrophic injury, but clung to life a few more days albeit in excruciating pain. Mary pleaded with William not bury her at sea because she hated the ocean and did not want her remains placed there for eternity. Upon her eventual death, William received permission to go ashore to bury his wife. He sewed her body into a red blanket that Mary had brought to keep warm on their long journey and laid her body to rest in the dunes. He made a temporary headstone out of a piece of driftwood and carved her name on it. He then vowed to return to Boston with a proper burial marker, but never came back. If one thinks she might be forgotten and that would be the end to this tragic story, Mary had other ideas. In 1804, a whaling ship takes refuge during a storm near the place of her burial and spots a lone figure walking the shoreline. She approaches, then vanishes over one of the dunes and is not seen again. In 1891, a lone soldier stationed at Fort Strong sees the ghost of Mary and is shaken by the experience. Visitors to Boston’s Long Island still report seeing a woman with gray skin wearing a red cloak wallowing through the dunes, blood dripping down her face. More grotesquely, she is said to have a gaping hole in the back of her head. THE BELL WITCH Wars and other military conflicts have always heightened the prospect of ghostly sightings as turmoil and tragedy seem to be a catalyst for severe paranormal activity left in its wake. But another early American ghost story’s battleground does not take place in pastures, towns or the ocean, but a farmhouse in Adams, Tennessee in 1817. John Bell was a successful farmer who owned over 300 acres of land there when one morning he encountered a strange looking animal in a corn field. he claimed it had the body of a dog but the head of a rabbit. He fires on the creature, and is all but certain he hits it, but it disappears. That same night it all began with knocking sounds on the outside of the house. This was following by a kind of gnawing on his children’s bed post as if a rat was chewing through it and complaints of them having their bed clothes pulled from them and pillows thrown on the floor. But soon came even more disturbing noises. The sound of someone gagging in the wee hours of the morning, chains rattling and rocks appearing out of nowhere and falling to the floor. The sounds of whispering can be heard. Too faint to discern but almost like an old woman singing hymns. Then the strangeness took a more violent posture. One of the Bell sons had his hair yanked so hard, that it lifted him out of his bed one night. Whatever or whoever this malevolent entity is, it then turns its attention to teen aged daughter Betsy. Betsy would have her hair pulled and often was slapped so violently and so often that she would display bruises in the form of handprints on her face and her body. The Bell family agreed reluctantly to keep all this a secret until one day, perhaps out of sheer desperation, John Bell shared their experiences with a neighbor named James Johnson. Johnson and his wife elected to spend the night at the Bells and to their horror, encountered much of the same terrifying phenomena John Bell had related to them. At one point after having the bedclothes torn from him and being slapped repeatedly, Johnson was said to cry out angrily in what is now considered to be a horror movie cliché, “"In the name of the Lord, who are you and what do you want!” The activity was said to cease after that. At least for the remainder of the night. The voice in time grew stronger and much more intelligible, quoting scripture, responding to the Bells questioning and continuing to sing hymns. The next part of the story is one that perhaps is steeped more in folklore than actual history, but it concerns General Andrew Jackson who, according to the legend, caught wind of the happenings at the Bell house and developed an interest in what was happening there and decided to pay a visit to the farm. As he and his men approached the house, a covered wagon that was part of his company stopped dead in its tracks and could not be moved by the horses pulling it. After a time had passed and failing to move the wagon, Jackson cried out, “"By the eternal, boys! That must be the Bell Witch!" At this point a female voice was heard to say they could now move the wagon and she would be seeing them again later that night. While Jackson and John Bell sat and had a talk inside the house, the rest of Jackson’s team kept watch, waiting for the Bell Witch to manifest. One of the men boasted that he could deal the witch and proceeded to pull out a pistol that he claimed had a silver bullet in its chamber. He went on to say the silver bullet could kill the witch and she had not made her presence known yet out of fear of the weapon. At that exact time the man began screaming and thrashing about saying he was being stuck with “pins”. At this point he was kicked in the rear end and sent flying out the front door. The witch then proclaimed there was another “fraud” in the General’s party and that he would be exposed later that night. Jackson’s men began to leave the farm house in sheer panic. But Jackson chose to remain to discover who the other fraud was the voice referred to. His men begged him to leave and it’s unclear what, if anything happened that night, but the entourage was seen in nearby Springfield the following morning. (As stated, there is a fair amount of reasoning to doubt Jackson ever actually visited the farm.) Betsy soon began to take an interest in a young man named Joshua Gardner. In time the relationship flourished and the Bells gave their blessing for her and Joshua to be married. However, the Bell Witch had an issue with this couple being united and would not hold her peace often imploring Betsy not to marry him. Complicating matters was the sudden appearance of a man named Richard Powell, a former teacher of both Betsy and Joshua who had for some time held a keen interest in Betsy. He had also expressed an interest in marrying her when she was old enough to do so. While all this was happening, he was married to another woman in Nashville named Esther Scott. When informed of Betsy’s impending marriage to Joshua, though he was disappointed to hear it, he wished them the best. Despite their intention to marry, the witch would not be deterred in her efforts to break up the couple. No matter where they went, she maintained a presence and eventually, worn down and feeling despondent over their situation, Betsy broke off the engagement, hoping it would lessen her own burden. For a while her torment seemed to ease if not stop completely, but by then the witch had set her sights on a much more formidable foe, John Bell himself. The witch constantly threatened to kill Bell and he began to develop some odd symptoms such as involuntary twitching in the face and difficulty swallowing, both conditions worsening over the course of a year. Eventually the once strong and industrious man was confined to his home, unable to physically carry out even the simplest of tasks. In this weakened state, he was subject to even more extreme torment by the Bell Witch who would slap his face any time he experienced a seizure and taunt him relentlessly. John Bell died on December 20, 1820 after slipping into a coma a day earlier. Soon afterwards a small vial of liquid was found in cupboard that no one could identify. His son, John Jr., gave some to the cat who died almost instantly. The entity then gleefully proclaimed, “"I gave Ol' Jack a big dose of that last night, which fixed him!" John, Jr. threw the vial into the fireplace and it exploded in a large blue flame that shot up the chimney. Even during his funeral, the witch’s voice could be heard happily singing songs and laughing and did not stop until the last mourner left the graveyard. All activity ceased at that point. An interesting side note to all this was a revisit by the witch some years later. This excerpt is from bellwitch.org written by Pat Fitzhugh: “In April of 1821, the entity visited John Bell's widow, Lucy, and told her that it would return for a visit in seven years. The entity returned in 1828, as promised. Most of its visit centered around John Bell, Jr., with whom the entity discussed such things as the origin of life, civilizations, Christianity, and the need for a mass spiritual reawakening. Of particular significance were its nearly accurate predictions of the Civil War and other events.